A man was found dead and 13 others were injured in the fire, officials said. 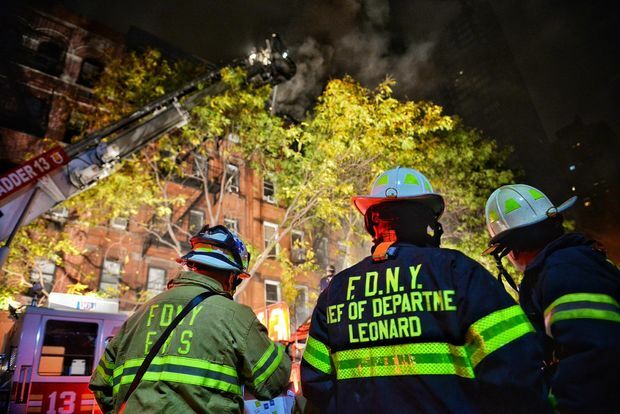 UPPER EAST SIDE — A man was found dead amid a massive fire that left 16 others injured as it tore through three buildings on East 93rd Street early Thursday, officials said. Lemmy Thuku, 25, was pronounced dead at the scene after he was found on the building's third floor, police said Friday. The blaze started on the first floor of 324 E. 93rd., near First Avenue, about 3:30 a.m. Thursday before climbing through the building and spreading to the two adjacent buildings, authorities said. "[Firefighters] were trying to break open doors and glass and all that. I didn't see the fire then, but when they broke open the glass, there was a this huge set of flames coming out of each floor. The whole building was on fire," said neighbor Rakesh Recharla, 32. "The flames were huge. The whole building was on fire. It was like something exploded," Recharla said. "The flames were bright orange, several feet high. No one could even go nearby. It was so hot. It was very scary," he added. The fire was so devastating partly because it climbed up the building from its first floor, trapping various people, according to FDNY Assistant Chief Roger Sakowich. "The fire on the first floor didn't allow anybody to come down the stairs, so they all had to go to the windows. The problem was there are only fire escapes on the front," Sakowich said. Firefighters struggled to rescue everyone and even have to rescue their own colleagues at one point who had become trapped on the fire escapes as flames shot out from the windows, Sakowich said. Firefighters spotted an 81-year-old man at the rear window of his fifth-floor apartment with flames at his back and no fire escape to climb to safety, Sakowich said. "The victim didn't have long. If they didn't get him when they got him, he wasn't going to have much longer," the assistant chief said. Rescuers got to the roof, but couldn't easily reach him by climbing down the front fire escape because of the shooting flames and instead opted for a daring, one-shot move called a "roof-rope rescue," officials said. One firefighter was tied to a rope that another lowered down the edifice as a third firefighter peered over the ledge, officials said. "You need a guy looking down because the guy lowering him can't see over, so you can't see how far he's going," Sakowich said. "Once he hears 'Stop,' then the guy stops and tries to make the grab. If you miss him, there's no pulling him back up to grab him," the assistant chief said. Firefighters lowered the elderly man, who'd suffered burns and smoke inhalation, to the ground so he could be taken to New York-Presbyterian/Weill Cornell Medical Center, where he was in stable condition as of Friday, officials said. Four other civilians and 11 firefighters had minor injuries, officials said. About 250 firefighters were able to bring the flames under control by 7:53 a.m., according to the FDNY's Twitter account. Mayor Bill de Blasio said he was thankful for the work of the firefighters. Thinking of the residents of 324 E 93rd this AM. Grateful for 200 @FDNY bravest who saved lives. #Rescue1 roof rope rescue simply heroic. Eighteen families were displaced by the fire, according to the New York Red Cross, which is working to give them blankets, food and shelter. It wasn't immediately clear what sparked the blaze, but officials don't believe it's suspicious. Officials suspect working smoke alarms and detectors alerted people in the unit where the fire started, Long said. Buses on the M15, M31 and M86 were all rerouted because of the fire, the MTA said. Commuters should check their site for up-to-date route information.